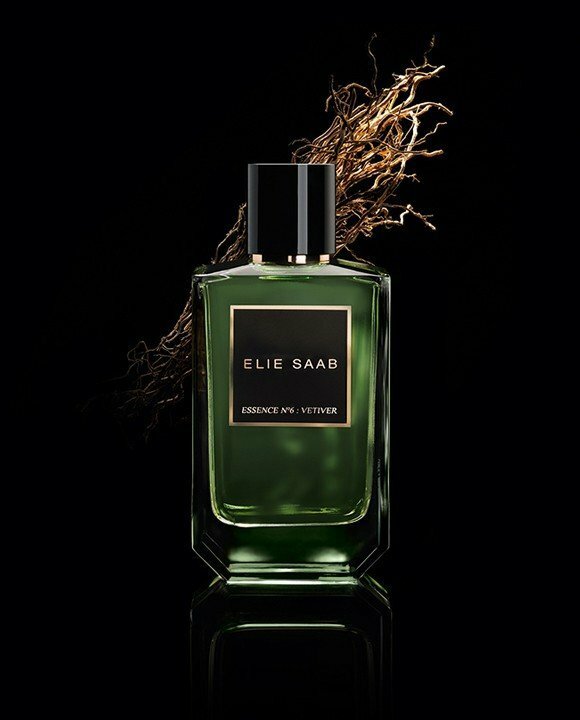 Essence N°6: Vetiver is a popular perfume by Elie Saab for women and men and was released in 2015. The scent is green-woody. It is being marketed by Shiseido Group / Beauté Prestige International. The clear handwriting of Kukdjian and also the Iso-E-Super charge, which is often enough treated as a question of faith here, do not disturb me at all in this fragrance. They are clearly present and skillfully used to create an essence of the vetiver. Aromas, of course equivalent to synthetically natural, of the highest quality, also the idea of vetiver and its familiar construction in men's fragrances and as a modernizer and slimmer of complex traditional women's fragrances. To highlight and bring to life certain facets. It's also not "just" a vetiver acetate scent like the Molecules, but the effect shows me a bright green ball that flies in the wind and turns like the star in one of these soap bubble happenings by Francis Kurkdjian. Beautiful, playful, dance. That may be boring for some, too smooth or too little, I like this clearly recognizable style. So let's assume that "Essence No. XY" isn't just another high-price line that also needs a name for marketing, and let's assume that the perfumer wants to stage what he thinks is the essence of vetiver. Then we find here from the beginning a romantically soft moment, velvety or better moist shining and on the other side a light bitter soapy layer. These layers are laid on top of each other and against each other, rotated, brought into separation and played off in the best sense of the word. The grass, the cool moisture of vetiver, its slenderness and clarity, but also the nutiness and woodiness, even a slight sweetness, I can discern in the interplay of moments over hours with this fragrance. I encounter the classic masculine suit-wearer-carefulness of the Vetiver, which comes across as refreshingly pleasant and distiguished. But also the modern slender line, which plays with the well-known facets and creates a green-blue shimmering bow from old to new. The scent shimmers in my perception, it almost shines neon green every now and then, then with a small slow elegant twist it appears to me naturally grass green again with a drop of rope. Then, tough brown wood. Pine green. At some point the mixture reminds me a little of galbanum with its bitter-vivifying effect. After a few hours, which have a rather flattering and fragrant character for me, AugustA, at the beginning, the scent becomes a little soapy and hot for a long time, as if to show that it can do that too, but never falls completely into the old men's shaving foam, which could seem a little out of place on women's skin. He intercepts this with another turn and dances again in all facets of dazzling green, full of light. The soap bubble flies on and bursts gently on the skin, exhaling all kinds of green aromas until a new one dances past. In the base, which is hardly recognizable as such, the fragrance slides a little more into the woody, becoming sweeter, slightly nutty, but never balsamic or completely calm. It keeps pulsing, slower and quieter. For me, this fragrance is intense, although monochrome yet colorful. Multifaceted, minimalistic in the consequent portrayal of Vetiver and everything that follows it well, so also something slightly flowery, something earthy-woody, austere as well as water-clear freshness. And yes, extremely modern too. Never over-twisted, for vetiverfreudige ladies like me as created. Lasts long and is never intrusive with good radiation. In short, I like it very much, this glowing emerald ball and it once again makes it clear why I like vetiver so much, even if it may not be the most feminine of all fragrances. But that's not a criterion anyway. Contrasts look good and this fragrance is of course a bright ornament for men and a very interesting nose catcher for ladies. Oh yes, excursions into the history of perfume - and Vetiver would offer a lot from Guerlain to Chanel to ELDO - are largely avoided for my perception, which I find pleasant. The scent stands for itself. And so it stands well. Grassy, fresh, woody and light earthy notes interwoven in a perfect way. Elegant and confident, without being pushy.